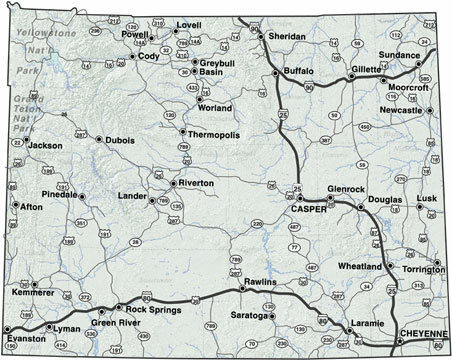 Wyoming is in the western United States. It is bordered by Montana on the north, South Dakota and Nebraska on the east, Colorado and Utah on the south, and Utah, Idaho and Montana on the west. The land within these borders was first called Wyoming in 1865, when a member of the U.S. Congress from Ohio suggested that a new territory be carved from Dakota, Utah, and Idaho territories. The name Wyoming is a contraction of the Native American word mecheweamiing ("at the big plains"), and was first used by the Delaware people as a name for the Wyoming Valley in northeastern Pennsylvania. 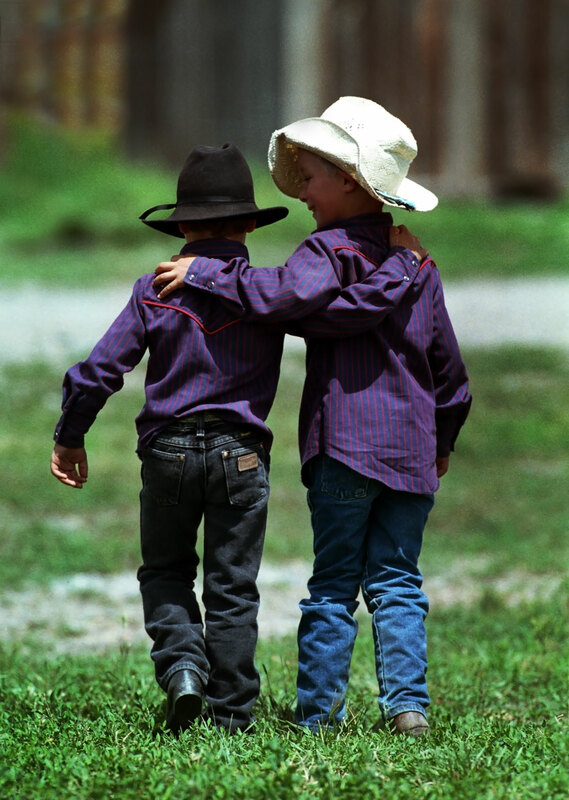 Wyoming is known as the Cowboy State and the Equality State. The latter recognizes Wyoming as the first state to specifically give women the right to vote, which it did as a territory in 1869 and retained upon entering the Union. Wyoming became a territory in 1868 and entered the Union on July 10, 1890, as the 44th state. It has a wealth of mineral and agricultural resources, and mining and agriculture still play major roles in the state's economy. During the same period the state ranked 50th among the 50 states in population and 50th in manufacturing. "Wyoming," © 1993-2008 Microsoft Corporation. All Rights Reserved. 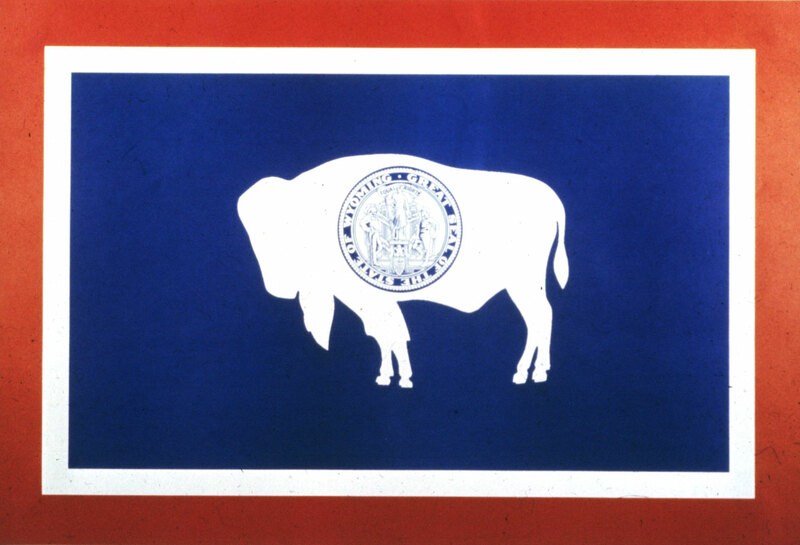 The Wyoming State Flag, designed by Mrs. A.C. Keyes of Casper (formerly Miss Verna Keays of Buffalo), was adopted by the fourteenth legislature on January 31, 1917. The Great Seal of Wyoming is the heart of the flag. On the bison, once the monarch of the plains, is the seal representing the custom of branding. The colors of the State Flag are the same as those of the National Flag. The red border represents the Indian and the blood of the pioneers who gave their lives reclaiming the soil. White is the emblem of purity and uprightness. Blue, the color of the sky and mountains, is symbolic of fidelity, justice and virility. The Indian paintbrush, common name for any of a genus of annual, biennial, and perennial herbs, was adopted as the State Flower on January 31, 1917. The genus, which contains about 200 species, is native to the cooler portions of North and Central America and Asia, and to the Andes. Because Indian paintbrushes, also called painted cups, are parasitic on the roots of other plants, they have not been naturalized and have rarely been cultivated away from their native habitat. The plants have long, hairy, unbranched stems with alternate leaves. The uppermost leaves, or bracts, are brilliantly colored and much showier than the inconspicuous interspersed flowers. The flowers, which are borne in spikes, have a two-lobed calyx, a two-lobed corolla, four stamens, and a solitary pistil. The corolla, which is usually yellow, is encased within the calyx, and is usually indiscernible. The fruit is a two-celled capsule. The common painted cup is the State Flower of Wyoming. The calyx of this plant is greenish white, but the bracts are intense vermilion. The scarlet paintbrush is a common wild plant of the eastern United States. The common Indian paintbrush is a hardy herb found in Canada and in the mountainous regions of the northern United States from New England to the Rocky Mountains. Its calyx is greenish white tinted with purplish red. Scientific classification: Indian paintbrushes make up the genus Castilleja, of the family Scrophulariaceae. 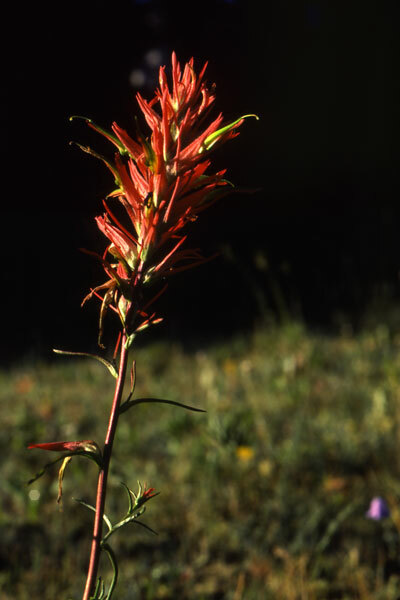 The common painted cup is classified as Castilleja linariaefolia, the scarlet paintbrush as Castilleja coccinea, and the common Indian paintbrush as Castilleja septentrionalis. "Indian Paintbrush," Microsoft ® Encarta ® Online Encyclopedia 2008 http://encarta.msn.com © 1997-2008 Microsoft Corporation. All Rights Reserved. Meadowlark is the common name for any of seven American bird species of a genus of the blackbird subfamily. The two North American species, the eastern and western meadowlarks, look very much alike but have different voices. Both are about 23 cm (about 9 in) long. They are brown streaked with black and buff above and bright yellow below, with a black crescent on the chest. They inhabit meadows and fields across the United States, their ranges overlapping in the middle west. They build domed nests hidden in the grass, where the females lay four to six white eggs, speckled with reddish brown. The range of the eastern meadowlark extends south to northern South America, where it meets the northernmost of five South American species, all characterized by having red rather than yellow breasts. 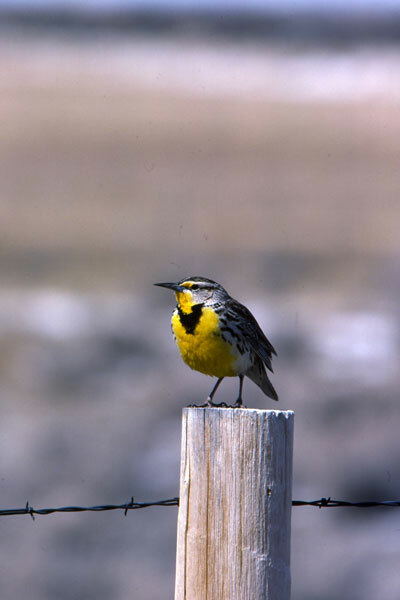 Wyoming adopted the meadowlark as its State Bird on February 5, 1927. Scientific classification: Meadowlarks make up the genus Sturnella of the subfamily Teterinae, family Emberizidae, order Passeriformes. The subfamily is sometimes considered a separate family, Icteridae. The eastern meadowlark is classified as Sturnella magna and the western meadowlark as Sturnella neglecta. "Meadowlark," Microsoft® Encarta® Online Encyclopedia 2008, http://encarta.msn.com © 1997-2008 Microsoft Corporation. All Rights Reserved. Cottonwood is the common name for several species of fast-growing, short-lived trees, members of the willow family. Cottonwoods are named for the cottonlike mass of hairs surrounding their seeds. They are related to poplars and aspens. Cottonwood trees may reach a height of 30 m (100 ft) or more and may have a trunk diameter up to 2.4 m (8 ft). The bark is rough, with deep fissures. Cottonwoods are fast growing but short-lived trees. They are easily propagated, and some are planted as ornamentals. The wood of cottonwoods is moderately soft and rather lightweight. It is used chiefly for boxes, crates, and the interior parts of furniture. The plains cottonwood is a large tree of the Great Plains and eastern border of the Rocky Mountains, and its range extends north into Canada. It grows to 27 m (90 ft). This tree is a subspecies of the eastern cottonwood, but it has hairy buds and lighter yellow branchlets. Its coarsely toothed leaves are often broader than they are long and have glands at the base of the leaf blade. 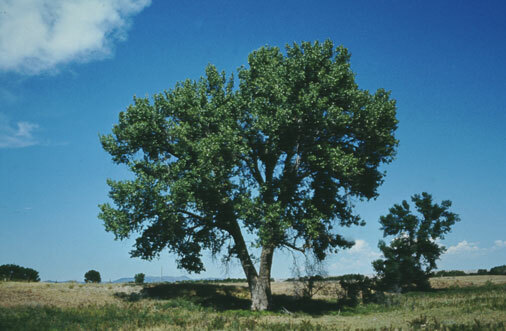 The cottonwood became Wyoming's State Tree on February 1, 1947. The statute declaring the cottonwood as our State Tree was then amended in 1961 to change the scientific name. Scientific classification: Cottonwoods are members of the family Salicaceae. The cottonwood is classified as Populus deltoides variety monilifera. "Cottonwood," Microsoft® Encarta® Online Encyclopedia 2008, http://encarta.msn.com © 1997-2008 Microsoft Corporation. All Rights Reserved. Jade is a compact, opaque gemstone ranging in color from dark green to almost white. 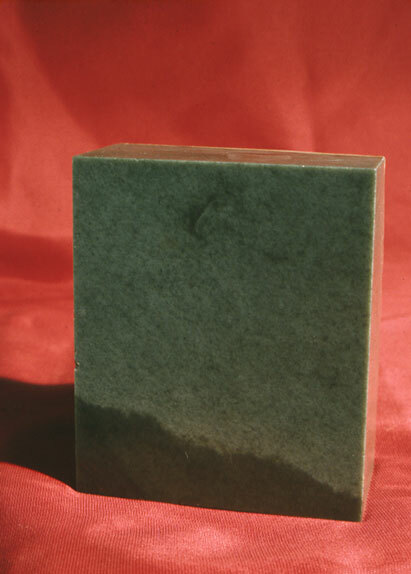 The term is applied to specimens cut from the minerals jadeite and nephrite. Wyoming's State Gemstone is of the nephrite variety and was adopted on January 25, 1967. Nephrite, a member of the amphibole group of minerals, is a silicate of calcium and magnesium, with a small amount of iron replacing part of the magnesium. It is a tough, compact variety of the mineral tremolite with a hardness of 6 to 6.5 and specific gravity 2.96 to 3.1. Polished nephrite has an oily luster. "Jade," Microsoft® Encarta® Online Encyclopedia 2008, http://encarta.msn.com © 1997-2008 Microsoft Corporation. All Rights Reserved. The bison, adopted Wyoming's State Mammal on February 23, 1985, is the largest terrestrial animal in North America, where it is commonly called buffalo. The bison is characterized by a hump over the front shoulders; short, sharply pointed horns (in both sexes) curving outward and up from the sides of the massive head; and slimmer hindquarters. A mature bull of the North American bison is about 2 m (about 6.5 ft) high at the hump and 2.7 to 3.7 m (9 to 12 ft) long and weighs 850 to 1100 kg (1800 to 2400 lb); the female is smaller. The head, neck, forelegs, and front parts of the body have a thick coat of long, dark hair. The rear part of the body is covered with much shorter hair. The adult bull usually has a black beard about 30 cm (about 12 in) long. k beard about 30 cm (about 12 in) long. 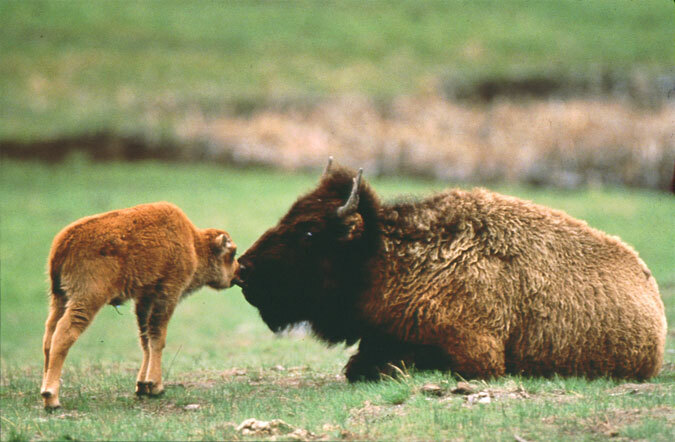 Scientific classification: Bison belong to the family Bovidae. The plains bison is classified as Bison bison bison, the wood bison as Bison bison athabascae, and the European bison as Bison bonasus. "Bison," Microsoft® Encarta® Online Encyclopedia 2008, http://encarta.msn.com © 1997-2008 Microsoft Corporation. All Rights Reserved. Cutthroat trout is a type of trout named for an orange mark behind the lower jaw. Cutthroat trout are adaptable fish with several subspecies, or stocks, that vary greatly in appearance and live in a variety of habitats. Inland cutthroat are freshwater fish, living in cool streams or lakes; coastal cutthroat migrate to sea after two to five years in freshwater. All cutthroat return to their native streams to lay their eggs, or spawn. Cutthroat are native to the western part of North America. Coastal cutthroat historically ranged from mid-Alaska to northern California. Inland cutthroat ranged from southern British Columbia and Alberta, Canada to New Mexico, and from eastern California to Colorado. Cutthroat have been transplanted widely and can now be found throughout North America. 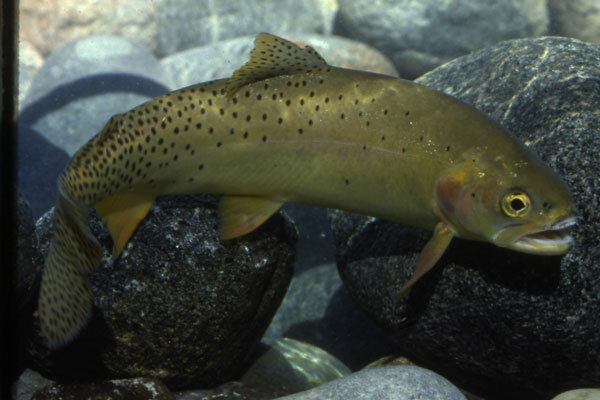 The cutthroat trout became Wyoming's State Fish on February 18, 1987. Scientific classification: The cutthroat trout is a member of the family Salmonidae in the Salmoniformes order. It is classified as Oncorhynchus clarki. "Cutthroat Trout," Microsoft® Encarta® Online Encyclopedia 2008, http://encarta.msn.com © 1997-2008 Microsoft Corporation. All Rights Reserved. 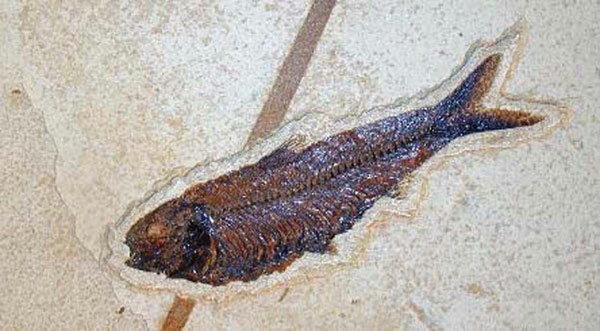 Knightia is an extinct genus of fish well-known from abundant fossils found in the Green River Formation of Wyoming. They rarely exceeded 25 cm in length and are found throughout the formation. Knightia became Wyoming's State Fossil on February 18, 1987. Knightia was a slender fish and seems to have been a secondary consumer, feeding mainly on ostracods, algal forms and diatoms, as well as some smaller fish. They were schooling fish, and because of this they are frequently found together in mass mortality layers. The tendency for individual fishes to cluster in groups was probably quite common. Modern forms of small fish are noted for schooling, and it is highly probable that the ancient types associated similarly. "Knightia," Wikipedia, The Free Encyclopedia 2008, http://en.wikipedia.org All Rights Reserved. The horned toad is a common name for a genus of short-tailed, short-legged lizards in the iguana family. They are called â€œhornedâ€ for the hornlike spines on the back of the head and sides of the body, and â€œtoadâ€ for their rounded, toadlike shape. Found mostly in dry regions of the western United States and Mexico, they are diurnal and can often be seen sitting motionless near ant mounds. Most species feed heavily on ants, but they will also eat other types of small insects and spiders. Their wide, flat bodies are about 8 to 13 cm (about 3 to 5 in) long. For defense, many species, including the coast horned lizard, can spray an intruder with blood from the corners of their eyes. The horned toad was adopted as the State Reptile on February 18, 1993. Scientific classification: Horned lizards make up the genus Phrynosoma of the family Iguanidae. 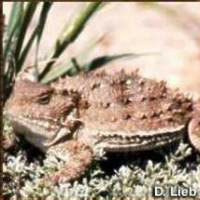 The coast horned lizard is classified as Phrynosoma coronatum and the Texas horned lizard as Phrynosoma cornutum. "Horned Lizard," Microsoft® Encarta® Online Encyclopedia 2008, http://encarta.msn.com © 1997-2008 Microsoft Corporation. All Rights Reserved. Wyoming's State Dinosaur, the triceratops is of the genus of four-legged, plant-eating dinosaurs that lived during the Cretaceous Period, more than 65 million years ago. Triceratops had three horns on its skull - one on its snout and one above each eye. The name is derived from the Greek words treis, "three"; kerat, "horn"; and ops, "face." Triceratops was one of the largest horned dinosaurs. The animal's other defining features include a beak and a neck shield, or frill. Triceratops belonged to a diverse group of ornithischian ("bird-hipped") dinosaurs called ceratopsians ("horn-face"), which populated North America and Asia toward the end of the age of dinosaurs. Many skulls have been recovered from sediments that floods deposited 67 million to 65 million years ago on low, coastal plains near a seaway that covered the interior of the United States and Canada. 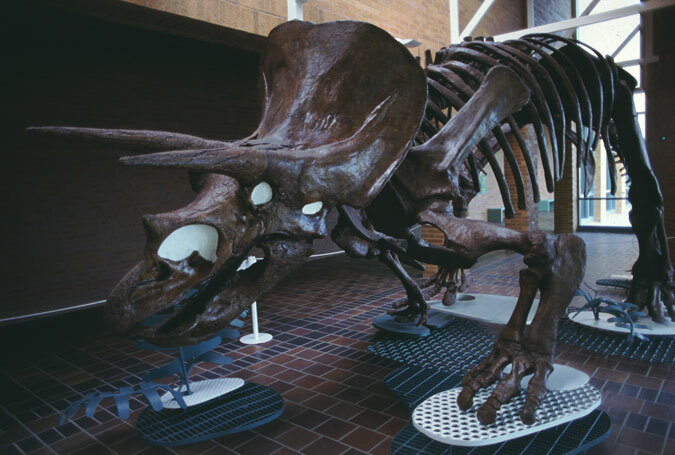 The triceratops was adopted as the State Dinosaur on March 18, 1994. "Triceratops," Microsoft® Encarta® Online Encyclopedia 2008, http://encarta.msn.com © 1997-2008 Microsoft Corporation. All Rights Reserved. Rodeo is a competitive sport in which riders display their skill in activities related directly or indirectly to livestock raising, such as riding and roping cattle and horses. The term "rodeo" comes from the Spanish word rodear (to surround) and originally meant "roundup." A rodeo usually comprises five standard events and may also include up to three nonstandard events, as well as a number of informal contests. Cash prizes are awarded. The sport is especially popular in the United States and Canada, and about 2,000 rodeos are held annually in those countries. Most major rodeos are under the jurisdiction of Professional Rodeo Cowboys Association, located in Colorado Springs, Colorado. The leading rodeos include Frontier Days, in Cheyenne, Wyoming; National Finals Rodeo, in Las Vegas, Nevada; National Western, in Denver, Colorado; Houston Livestock Show and Rodeo, in Houston, Texas; and Calgary Exhibition and Stampede, in Calgary, Alberta. 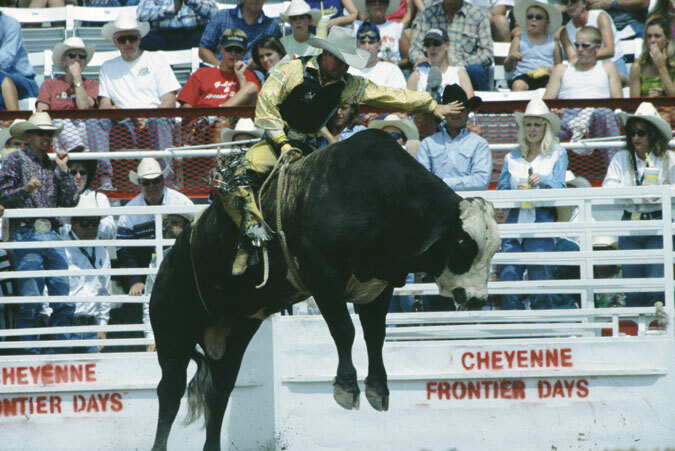 Wyoming adopted the rodeo as its State Sport during its legislative session in 2003. "Rodeo," Microsoft® Encarta® Online Encyclopedia 2008, http://encarta.msn.com © 1997-2008 Microsoft Corporation. All Rights Reserved. Sacagawea was the Shoshone Indian who assisted the historic Lewis and Clark expedition. Between 1804 and1806, while still a teenager, she guided the adventurers from the Northern Great Plains to the Pacific Ocean and back. Her husband, Toussaint Charbonneau, and their son who was born during the trip, Jean Baptiste, also accompanied the group. Sacagawea knew several Indian languages, and being Shoshone, could help Lewis and Clark make contact with her people and acquire horses that were crucial to the success of the mission. Her contribution far exceeded anything Lewis and Clark had expected. She provided crucial knowledge of the topography of some of the most rugged country of North America and taught the explorers how to find edible roots and plants previously unknown to European-Americans. Most crucially, Sacagawea and her infant served as a "white flag" of peace for the expedition, which was as much a military expedition as a scientific one. They entered potentially hostile territory well armed but undermanned compared to the Native American tribes they met. Because no war party was ever accompanied by a woman and infant, the response of the Native Americans was curiosity, not aggression. Sacagawea died at the age of 25. Her grave is located in Lander, Wyoming. In 2000, U.S. Senator Mike Enzi (R - Wyoming), a member of the Senate Banking Committee, nominated Sacagawea for the dollar coin. Wyoming named the Sacagawea Golden Coin its State Coin on March 2, 2004. 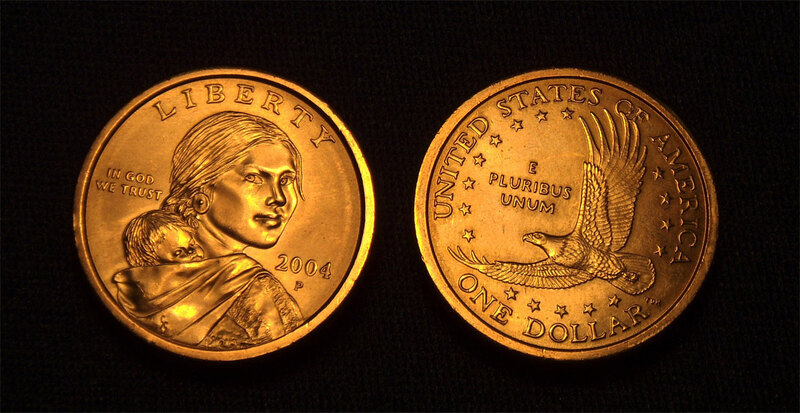 "Coins and Medals: Sacagawea Golden Coin," © 1998-2008. The United States Mint. All Rights Reserved. Western wheatgrass is a perennial and sod-forming grass, native to most parts of the United States except the humid southeast. It is a dominant species in the Central and Northern Great Plains. Plant growth is vigorous, reaching 2 to 3 feet in height. Leaves are up to 12 inches long, 0.25 inch wide, rather stiff and erect. The whole plant is covered with a grayish bloom. It thrives best on rather heavy soil, but is adapted to a wide range of soil types, including alkaline soil. Both as pasturage and when cut for hay while still succulent, it is relished by all classes of livestock. The plants are usually grown from seed, but spread from underground rhizomes to form dense sods. This is a very valuable grass, both for feed and for erosion control. Scientific classification: Western wheatgrass is classified as Pascopyrum smithii. Wyoming adopted the western wheatgrass as its State Grass on February 28, 2007. 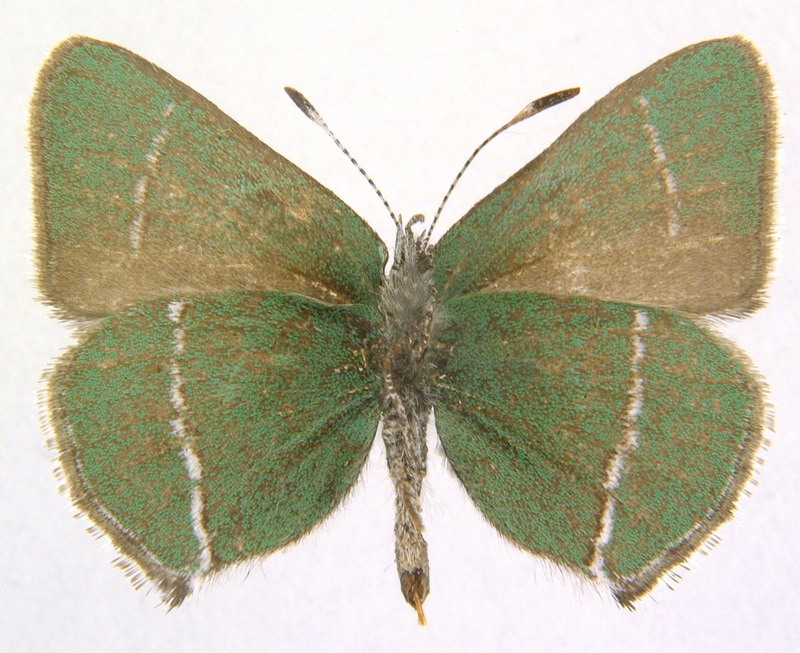 Scientific classification: Sheridan's green hairstreak is classified as Callophrys sheridanii, one of four species of the genus Callophrys. It is a member of the family Lycaenidae. The name is derived from the Greek words kallos (beauty) and phryktos (beacon). Sheridan's green hairstreak is assigned to the subfamily Theclinae, commonly known as hairstreaks because many species have tiny hair-like tails off the tips of the hind wings. However, species of Callophrys have rounded hind wing margins without tails, so these are sometimes called tail-less hairstreaks. Dr. Scott Shaw, Professor of Entomology and Insect Museum Curator, University of Wyoming, Laramie, WY. The code of the west, as derived from the book, Cowboy Ethics by James P. Owen, and summarized as follows, is the official state code of Wyoming. The code was adopted as Wyoming's State Code on March 3, 2010. The Wyoming Legislature adopted the Wyoming Big Sagebrush as the State Shrub on March 3, 2016. Artemisia tridentata, commonly called "big sagebrush", Great Basin sagebrush or "sagebrush," is an aromatic shrub from the family Asteraceae which grows in arid and semi-arid conditions, throughout a range of cold desert, steppe, and mountain habitats in the Intermountain West of North America. Sagebrush is not a desert plant, but rather an evergreen shrub, keeping some of its leaves year-round (although it loses many of them in the late summer). In particular, the Artemisia tridentate subsp. Wyomingensis ("Wyoming big sagebrush") is found in the drier portions of the sagebrush steppe , i.e. an ecoregion where the climate encountered in regions too dry to support a forest, but not dry enough to be a desert. 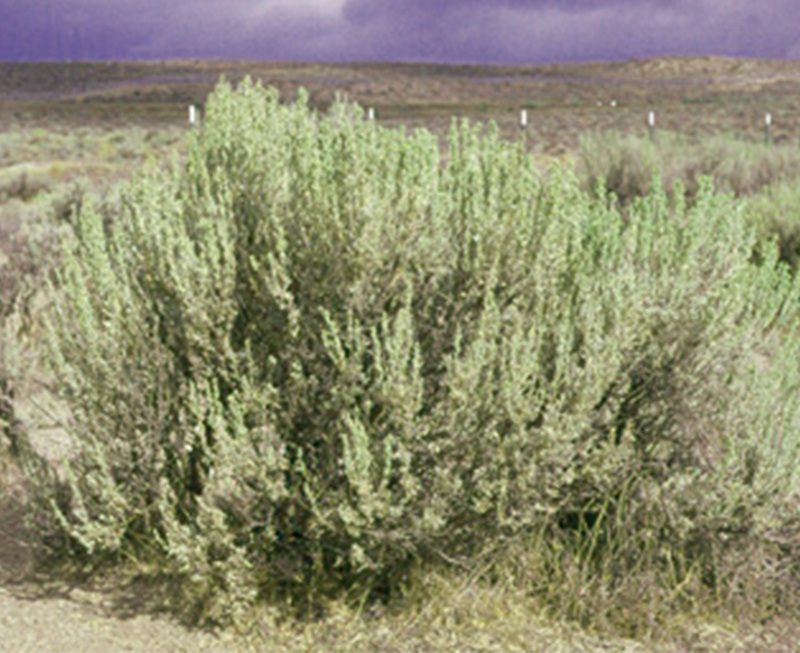 Big Sagebrush is a coarse, many-branched, pale-grey shrub with yellow flowers and silvery-grey foliage. Big Sagebrush flowers in the late summer or early fall and the small, yellow flowers are in long, loosely arranged tubular clusters. The fruits are seed-like and have a small amount of hairs on the surface. 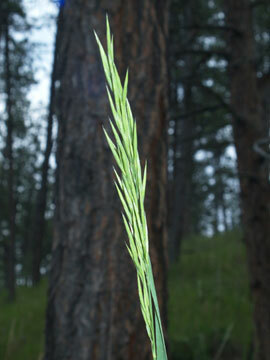 Big Sagebrush can also reproduce through sprouts. Sagebrush provides food and habitat for a variety of animal species, such as sage grouse, pronghorn, gray vireo, pygmy rabbit, and mule deer. Sagebrush also creates habitat for many species of grasses and herbs. A deep taproot, coupled with laterally spreading roots near the surface, allows sagebrush to gather water from both surface precipitation and the water table several meters beneath. Big sagebrush that is over a meter tall is an indicator of arable land, because it prefers deep, basic soils. Sagebrush is generally long-lived once it makes it past the seedling stage, and can reach ages of over 100 years. Big Sagebrush has a strong pungent fragrance (especially when wet) due to the presence of camphor, terpenoids and other volatile oils. The taste is bitter and, together with the odor, serves to discourage browsing by many herbivores. https://en.wikipedia.org/wiki/Artemisia_tridentata. Photo by Gary A. Monroe @ USDA-NRCS PLANTS Database. 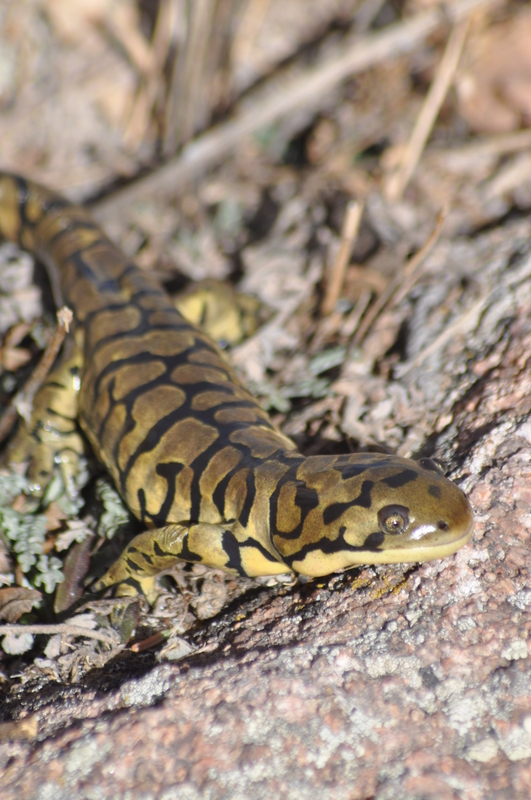 The Wyoming Legislature adopted the blotched tiger salamander as the State Amphibian on February 19, 2019. The Blotched Tiger Salamander typically grows from 15 to 22 cm (5.9 to 8.7 in) but it can grow to 30.5 cm (12.0 in) long at the most and is one of the largest species of salamander in North America. It has a broad head and a sturdy body. The color is variable across its range. The dorsal surface is grey, dark brown or black with bars and spots of muddy yellow giving it a tiger-like coloring. The ventral surface varies from light to dark. In Wyoming, the tiger slamander is found throughout the state at elevations lower than about 10,000 feet (Baxter and Stone 1985). Western Tiger Salamanders are primarily active from March to September. From March to June, adults migrate to temporary or permanent ponds with shallow water to breed. Adults eat insects, earthworms, and other small invertebrates. Three subspecies of the tiger salamander occur within the state. In Wyoming, tiger salamanders can be found in rodent burrows, cellars, window wells, and manure heaps, where they can escape extreme dryness (Baxter and Stone 1985). https://en.wikipedia.org/wiki/Barred_tiger_salamander and https://wgfd.wyo.gov/WGFD/media/content/PDF/Habitat/SWAP/Amphibians/Western-Tiger-Salamander.pdf. Photo by Ian Abernethy, Zoologist, Wyoming Natural Diversity Database, University of Wyoming.